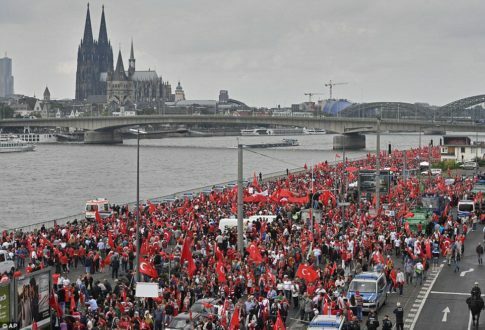 Thousands of people have gathered in the German city of Cologne to hold a demonstration in support of the Turkish President Recep Tayyip Erdogan following a failed coup attempt. However, they were met by several counter-rallies also being held. 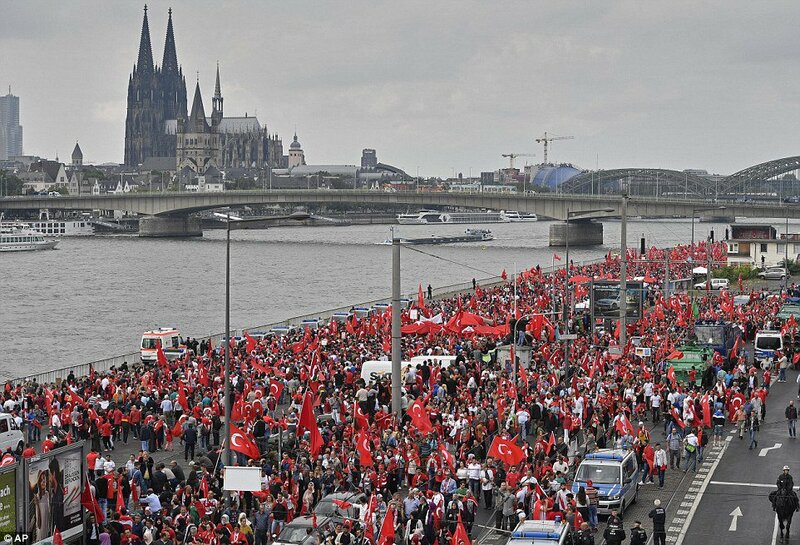 Erdogan’s supporters gathered near the banks of the river Rhine in Cologne’s Deutz district. They started arriving early in the morning, even though the demonstration was scheduled to start at 3pm local time (14:00 GMT). Many demonstrators came by buses from other German cities and even from neighboring countries, such as Belgium, France and Switzerland, the German media reported. The number of demonstrators reached around 40,000 people, according to police estimates. At the same time, some media outlets put the number of people gathered for the rally at 35,000. However, the organizers say that 50,000 people took part in the march, as reported by Focus Online. Witnesses were telling the local media that there was a steady stream of people attending the rally. An area for the marchers was cordoned off, but such was the volume of demonstrators, they started gathering outside the designated area. An activist group called the Union of the European Turkish Democrats (UETD) organized the rally, which was entitled “Yes to democracy, no to the coup.” However, some experts believe that the organization is merely a lobby group from Erdogan’s AK Party. The aim of the event was to officially condemn the attempted coup that took place on July 15.. The rally started with the German and Turkish national anthems followed by a minute’s silence in the memory of the victims of the coup attempt as well as of those killed in the recent terrorist attacks in France and Germany. Several Turkish officials attended the rally, including the country’s sports minister. The organizers wanted to show an address by Erdogan to his supporters on a big screen. However, a German court shelved the plan after the police had cited security concerns. The decision caused outrage among Turkish officials, who called it “unacceptable” and demanded explanations from the German authorities. “It’s unacceptable that the authorities who remained silent to demonstrations of terror organizations are trying to block a democratic anti-coup demonstration,” Turkey’s Presidential spokesperson Ibrahim Kalin said in a statement. “This ruling is unacceptable from a legal perspective. It is clear that this was a political decision,” Zafer Sırakaya, head of the UETD, told Anadolu Agency. Several other demonstrations were being staged around the city. A far-right party ProNRW and the HoGeSa (Hooligans against Salafists) group held their own protests under the slogan, “No tributes to Erdogan in Germany: Stop the Islamist autocrat from the Bosporus” near the Cologne’s central railway station. About 250 of people joined the far-right rally according to the German media. The organizers initially planned to march through the city but police, for security reasons, banned the rally. However, some demonstrators tried to start the march in defiance of the police ban and shouted, “Clear the street!” Police surrounded the rally and managed to disperse it without any serious incidents. Cologne also witnessed an anti-Nazi rally staged by some leftist groups and youth movements. The demonstrators marched through the center of the city holding placards that read “Against nationalism and racism in Germany and in Turkey.” About 600 people participated in the demonstration, according to the local media. Another rally under the slogan, “Stop the Erdomania! 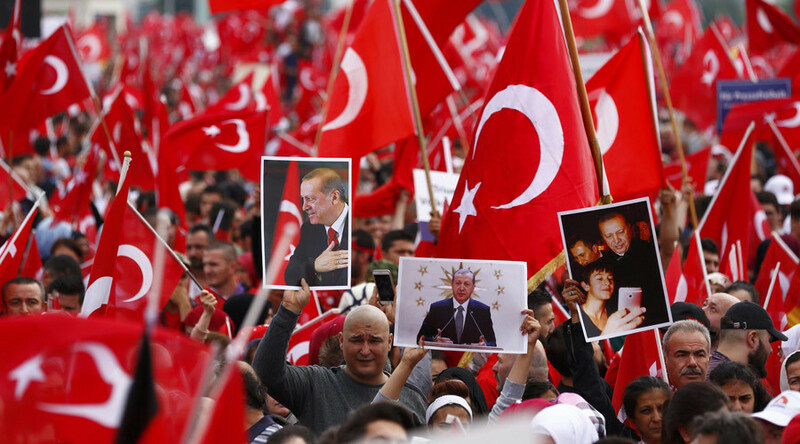 – For the democracy and human rights in Turkey,” was staged by the youth wings of a number of German political parties: the Greens, the Social Democrats, the Left party, and the Free Democrats. About 1,500 people, according to local media, attended the rally. Police deployed about 2,700 officers in the city amid fears of possible outbreaks of violence. Some members of the police contingent were Turkish speakers, while no serious incidents were reported. 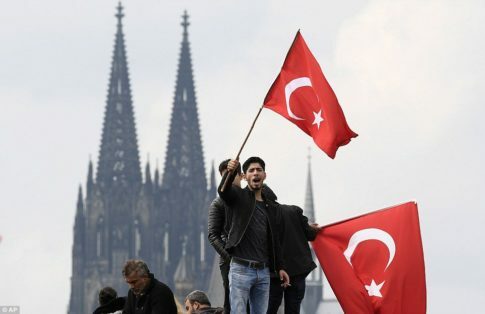 Earlier, a number of German politicians called on members of the public not to bring internal political tensions from Turkey to Germany and not to intimidate people with other political beliefs in the wake of the massive pro-Erdogan rally in Cologne.